An often overlooked component of athletic development is mobility. In their desire for strength most high school athletes and coaches rarely perform a proper warm up and/or cool down instead choosing to jump right in to their workout and start crushing the weights. This is a huge mistake as the athlete will not only perform at sub optimal levels but they will be at a greater risk for injury. Now athletes don’t need to be practicing yoga and spending an inordinate amount of time stretching but they do need a normal range of motion in all of the major joints, enough to sufficiently support the movements involved in their particular sport. Basically, what athletes need is mobility that aids in efficient movements. Before we venture any further, let’s see what the difference between flexibility and mobility really is. Flexibility is the joint’s capacity to be passively moved through a wide range of motion. If you can manage to touch your toes with your fingertips without having to bend your knees, you are quite flexible. Mobility on the other hand is our ability to move a joint through the same range of motion with increased efficiency and strength. Muscular stretches are known to be the best way to improve our flexibility, whereas, dynamic muscular movements are the best ways to improve our joint mobility. The following are four mobility exercises that will help you run faster and lift more weight so you can dominate on the athletic field. Our hip flexors are directly tied to our day-to-day functionality. Literally everyone, ranging from professional athletes to senior citizens, needs strong and healthy hip flexors to go about their daily tasks. 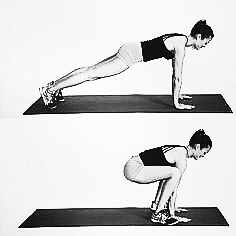 To perform this exercise, kneel down on one knee with your torso upright. Now slightly lean forward till you feel a nice stretch right next to the groin, hold this for 2-4 seconds and repeat a minimum of 5 reps. As you advance you can elevate the rear leg to increase the intensity of the movement and strengthen the hip flexors. To perform a groiner, get in the push up position, which will be your starting position. Now, with your weight on your arms, jump forward so that your legs land right outside of your hands. Jump back into the pushup position to complete one rep.
To perform fire hydrants, position yourself on both, your hands and your knees, facing down on the floor. Now, lift one knee off the floor and rotate them in circular motion, bring your knee up to your chest and then back behind you. Perform the rotations and then switch directions and do another ten big rotations with the other leg. My personal favorite…to perform this exercise, stand with a wider than shoulder width stance, now, turn one foot out towards the side with your toe off the floor. Make sure you keep your knee completely straight and then squat with your other leg. Make sure you keep both of your heels grounded and your spire completely straight. Now, return to the starting position and perform the movement with your other leg to complete one rep. Doing these mobility exercises will allow you to improve your range of motion through increasing mobility in your joints. These will help you increase your running speed, lift more in the weight room and improve your athletic performance in your chosen sport. About Shawn Balow: Shawn holds a Masters degree in Exercise Physiology from the University of South Florida and is a Level 2 Certified Fitness Professional by the Titleist Performance Institute and in Unconventional training by the Onnit Academy. He also hold additional certifications from the American College of Sports Medicine and is a USA Track & Field Level 2 jumps coach. After working in the fitness industry and coaching scholastic athletes for the past 20 years Shawn founded the Tampa Strength Academy located in Tampa, Fl. The Academy’s focus is on helping people achieve their training goals through a fun, unique and extremely effective training system.